Hi! Stephanie from Swoodson Says; I have completely fallen down the rabbit hole of DIY Christmas ornaments this year and have been creating some fun patterns. 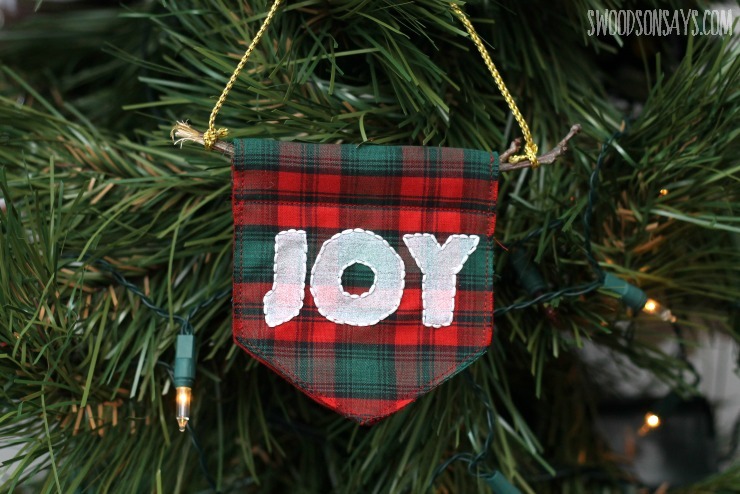 I like ornaments that catch your eye when you’re looking at a tree; you could put all sorts of words on this base pennant shape and have it look great! If you’re looking for more ornaments, be sure to check out my free felt wine glass pattern, it has sequins! 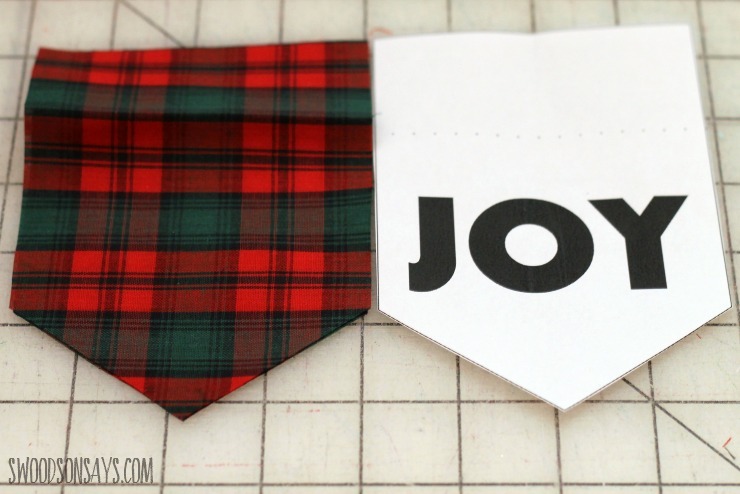 To personalize your pennant, try making your own stencil and use someone’s initials, your state, or a favorite holiday silhouette instead of ‘JOY’. 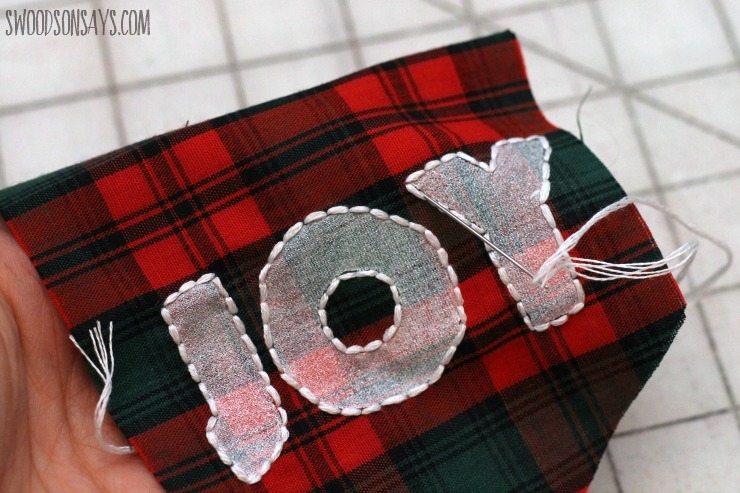 Experiment with different embroidery stitches or metallic floss to really make the project pop. If you’re ready to make your own, keep reading! 1- Cut two main pennant shapes out of the cotton fabric – use the iron and press down the top “hem” based off of the pattern’s dashed line. 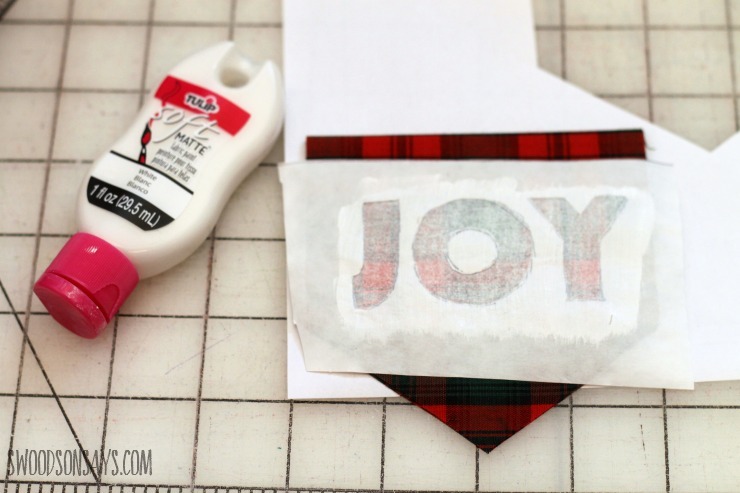 2-Print the template and trace/cut the stencil out with freezer paper – if you aren’t familiar with the material or technique, check out this post explaining it! 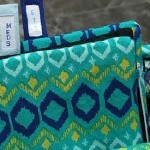 Iron it down and paint with fabric paint in the bare space. Let dry and peel off the paper. 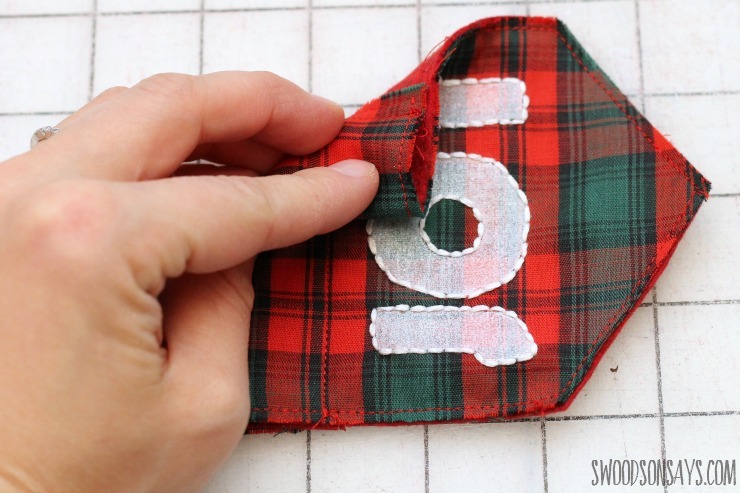 3-Use a simple back stitch (or other stitch of your choice) to outline the letters. 4- Sew the two main body pieces together, wrong sides together. 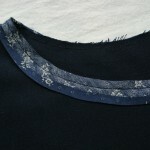 Sew a line straight across, approximately 1.25″ down from the top. 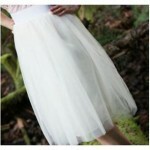 This will create a channel for the dowel/stick to pass through. Push your stick through the channel, break off ends if desired, and tie the ribbon ends to each end of the stick. Hang it up and enjoy!